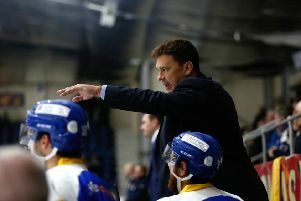 Fife Flyers are one of a handful of ice hockey clubs who can claim to have beaten the Olympic champions. The remarkable result was one of the sport’s post-war highlights in Kirkcaldy. The Canadian Olympic team embarked on a Scottish tour, and arrived with a near perfect playing record – just four defeats in 44 matches. That gives some context to the scale of Fife Flyers’ 6-5 victory – a result all the more remarkable considering they trailed 4-0. The world champs lined up against a club side with ten senior players and one junior, Jimmy nMitchell – the only Kirkcaldy lad to play in the match. The Kirkcaldy Times hailed “an unparalleled performance” and “the most epic game ever staged on Fife ice”. Diminutive centre ice, Ken Potts, scored the game winning goal to ensure Flyers were the only side to defeat the Canadians on their Scottish visit. The visiting skipper was gracious in defeat. There were jubilant scenes inside the Fife dressing-room as the magnitude of the win started to sink in. The manner in which Flyers turned over the world’s greatest national team will remain with all who witnessed it. The comeback was inspired by netminder Babe Scholtz who stood on his head time and again as the Canadians charged down the ice at every opportunity - they outshot Flyers 14-3 the last period alonel, and that tally didn’t include the many screamers which flew past the posts and struck the back boards. Playing his first exhibition game of the season, Scholtz was the showman who saved the team on dozens of occasions in the dying minutes alone. He was helped by the great form of skaters such as Tommy Londry and Floyd Snider who were extremely gallant in their defensive duties. And yet, they were powerless to stop the Canadians sweeping into a 3-0 lead with just seven minutes played. Hibbert opened the scoring from close range and Gravelle added a quick double to set the world champions up for appeared to be a comfortable evening. Ranaud then collected the puck in his own zone and stickhandled his way down the ice to net a tremendous solo goal for 4-0. But the Canadians appeared to under-estimate the fighting spirit of their hosts, and, by the time they recovered their composure, their lead had been wiped out. O’Rourke grabbed a lifeline for Flyers with a goal shortly before the break, only to see Dunster make it 5-1 after 26 minutes of play. O’Rourke then made all the running for Hawkins to net with a first time shot into the roof of the net for 5-2, and, just 30 seconds later, the same player rang the red light again. Three minutes later, Hawkins grabbed possession of a loose puck, rounded Dunster and whipped a shot past the netminder and top shelf for 5-4. The tension was “quite unbearable” as the players returned for the final period, and the fans went wild when Bud Scrutton – one of the game’s great post-war stars - connected with a Fowler pass and netted the equaliser. Immediately after the change-over halfway through the third period - back then the teams swapped ends after 10 minutes of play - Flyers grabbed the lead for the very first time as Potts rounded off a three man move by slamming the puck into the net. They pulled their goalie for the final 20 seconds, but could not grab an equaliser. At the final buzzer, Scholtz was mobbed by his team-mates and they, in turn, by their jubilant fans.